The Chuetsu Pulp & Paper Sendai facility in the northwestern part of Japan's Kagoshima prefecture is blessed with a generous water supply from the Sendai River. Since 1954, Chuetsu Pulp & Paper has been operating a paper mill in this area, producing fl ame-resistant, fine and other paper types as well as paper products such as cups. Chuetsu Pulp & Paper places a high priority on protecting the environment and on maintaining a good relationship with the local community. 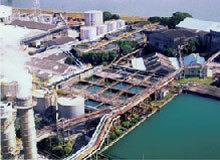 Why did Chuetsu Pulp & Paper select Yokogawa? Paper mills generally use high volumes of water 24 hours a day and seven days a week. The Chuetsu Pulp & Paper Sendai facility uses water directly from the river and then treats it with an industrial water purifi cation system before returning it to the river. By using telemeters, operators can monitor and control the water intake upstream of the facility in real time. In the past, these operators controlled the intake water volume by manually monitoring and adjusting the balance between water consumption and water intake. With the introduction of Yokogawa's CENTUM CS 1000 production control system, it has been possible to automate this process. The new control system also makes it possible to integrate the two previously independent functions – water intake and water treatment – by centralizing all information. Also, the CENTUM CS 1000 is used to perform real-time analysis of process parameters such as the water consumption amount and to provide this information over a network to a management information system. The CENTUM CS 1000 lessens the operator workload by automating processes and reduces the facility's impact on the environment by ensuring that no more water is taken from the river than is absolutely necessary. This protects precious natural resources and preserves the environment. 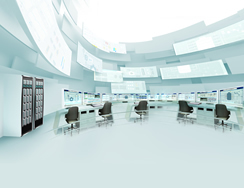 Another benefit of the CENTUM CS 1000 is that the facility can now be monitored from a remote location over an information network. Mr. Hatanaka, Electric Instrumentation Division, Chuetsu Pulp & Paper, said the following: "We already had experience with the CENTUM CS in our power-generating plant, where it has been operating 24 hours a day without any problems. So, we knew Yokogawa's products were reliable and that is why we selected the CENTUM CS 1000. With the support of Minami Kyushu Koyo Electric Company (an agent of Yokogawa), there were never any problems with the remote operation and with the integration of systems, even when fi rst starting up. This had been a big concern of ours."